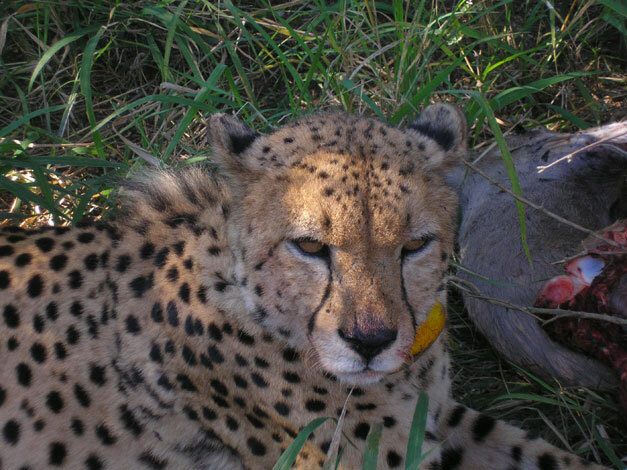 On the 8th of June our two guides – Lusinda and Cecile – were tracking Khula, the hand-reared cheetah that was released at HESC (Hoesdspruit Endangered Species Center) recently. They picked up a strong signal from his collar* near Mbezi Plains, which is on the western boundary of Kapama Private Game Reserve. There was no sight of Khula, so they decided to track him on foot. About 300m into the bush, and at precisely eleven minutes past ten (momentous occasions need to be noted in detail) they came upon a wonderful sight. Khula had just pulled down a young kudu bull. He’d only just started tearing the animal open when Lusinda and Cecile arrived, which means he must have made the kill literally seconds before they found him! He was feeding with gusto, and on the whole seemed extremely pleased with himself. Khula stayed at his ‘property’ for five days before he finally finished his meal. And once he’d moved out the area, the jackals wasted no time swooping in on his leftovers! * Bechem Lubrication Technology sponsored a cellular tracking collar device so that Khula’s movements could be tracked online. Visit Afrika Wildlife Tracking and use the following username: Bechem and password: Afrika to log in.